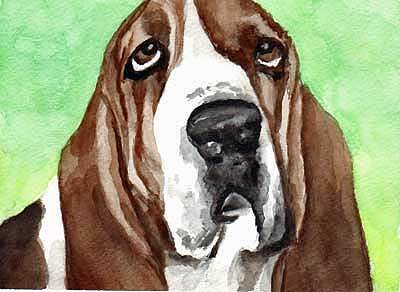 Hello and welcome, I'm Liz and I paint small original watercolor pet portraits from your photos in a modern contemporary style. My method is fast and loose and full of energy. I don't just copy your photo but use it to create a whole new composition while still retaining the character and personality of your cherished pet. 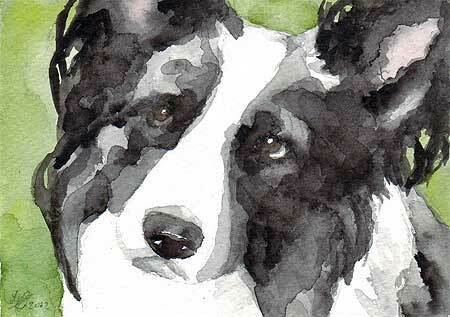 The result is a contemporary pet portrait that looks unique and original, not just copied from a photograph. I paint in three sizes ranging from 7 x 5 inches to 14 x 11 inches. Commissioning from me means there is no risk, no obligation, no contract to sign and NO DEPOSIT taken. I paint it first then you decide if you like it enough to buy it. All I need to get started is at least one clear photo that can be emailed to petportrait@gmx.com After the painting is finished it will be shown to you on the internet and you will only be asked for payment if you want to proceed with the purchase. Once payment is received the artwork will be shipped to you already matted so it's ready to pop into a standard size frame. If you need more information please don't hesitate to contact me, I'll be happy to answer any questions you may have. Shipping and matting is included in the price. For destinations outside of Canada and the US shipping is extra. Prices quoted are in US currency. No deposit required, just email a photo of your dog or cat and my paintbrush is ready to go to work! Because of the way they are composed, I can only include one pet in a single painting but if you commission 2 or more pet portraits at the same time, I will give a 10% discount on each portrait. 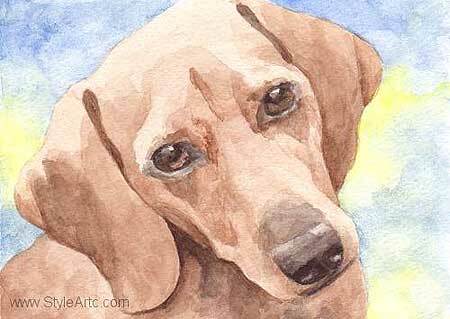 My watercolor pet portraits are made on 100% acid free heavy weight art paper by Strathmore. They are enclosed in a white or off white mat and backed with foamcore. Artwork is drawn by observation not by tracing a photo. I compose the painting by first manipulating your photo on the computer to get a pleasing modern looking composition, then I proceed to draw and paint by hand with real paint and paper using the manipulated photo as a visual reference guide. The final result are original pet portraits that look painted from life and not from a photograph. From the time I receive your photo to delivery takes around 6-8 weeks. Payment is by money order, checks also accepted but the check needs to clear before painting is shipped. Paypal only accepted if paid in Canadian currency. Send as many photos as you like but I need at least one clear snapshot. Photos don't need to be of high quality, the important thing is that they clearly depict facial details, but if you only have a not too perfect snapshot email it anyway and I'll see if I can work from it. You own the portrait but I own the copyright, that means you can't use it for commercial purposes such as selling it on posters or other merchandise without my permission. Watercolor art should be framed under glass. I know how much pet companions are cherished and so try to do my best with each portrait I make, but if you don't like what you received for whatever reason, you can return the painting within 30 days of delivery and receive your full money back.